The health benefits of turmeric come mainly from its primary active agent, which is curcumin. The World's Healthiest Foods encyclopedia explains that along with health benefits, curcumin is also what gives turmeric its yellow color. Turmeric does contain a few vitamins, however, and eating a little turmeric throughout the day will not only help you consume necessary vitamins, it will increase your intake of beneficial curcumin. The B vitamins are the most prevalent vitamins in turmeric, with vitamin B6 having the highest content. One tablespoon of turmeric contains 0.122 mg of B6, according to the United States Department of Agriculture. Vitamin B6, also known as pyridoxine, is needed for proper metabolism, the production of red blood cells, the production of hemoglobin which carries oxygen to tissues, and for the immune and nervous system to function properly, according to the National Institutes of Health. Other B vitamins also partake in these functions with B6, and are found in turmeric in trace amounts. Vitamin C, also referred to as ascorbic acid, is an essential vitamin, as the body is not able to produce it, so the only way to get it is from the foods you eat or supplements. According to the Linus Pauling Institute, vitamin C aids in the production of collagen, which is a building block of skin and tissues. It also helps produce neurotransmitters, which are important for brain function and help regulate mood. A powerful antioxidant, vitamin C is well known for its immune system boosting properties. 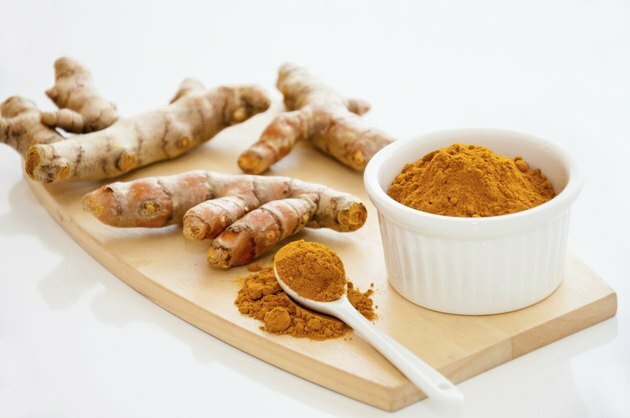 One tablespoon of turmeric contains 1.8 mg of vitamin C.
One tablespoon of turmeric spice also includes trace amounts of vitamin E and vitamin K, with 0.21 mg of vitamin E and 0.9 mcg of vitamin K. Vitamin E is an antioxidant vitamin that helps fight the damage caused to the body by free radical molecules. Vitamin E also plays a role in keeping the immune system strong and in the metabolic processes of the body, according the the National Institutes of Health. Vitamin K is a vitamin that often goes unmentioned, until it is needed. The NIH reports that vitamin K plays a major role in the clotting of the blood, and it is also being studied for its role in maintaining bone health.